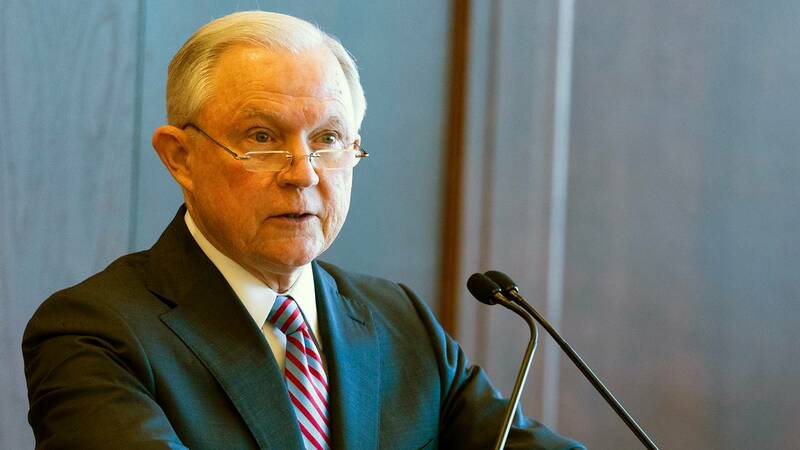 Attorney General Jeff Sessions delivers remarks on immigration and law enforcement actions at Lackawanna College on June 15, 2018, in Scranton, Pennsylvania. WASHINGTON (CNN) - Attorney General Jeff Sessions asserted in an op-ed published late Tuesday that migrant children who are held by the Department of Health and Human Services, including those who are separated from their parents, are "well cared for." His op-ed comes amid loud and growing criticism of the Trump administration's policy of prosecuting those who cross the US border illegally, which results in the separation of families. "In fact, they get better care than a lot of American kids do. They are provided plenty of food, education in their language, health and dental care, and transported to their destination city --- all at taxpayer expense," Sessions wrote in the USA Today op-ed. "Separations are temporary and rare," the attorney general wrote, adding that "the vast majority of children in custody came to this country by themselves." Since the Trump administration instituted its "zero-tolerance" policy on immigration this spring, under which anyone caught entering the US illegally is referred for criminal prosecution, more than 2,000 children have been separated from their families. The policy and the resulting separations have been widely criticized by lawmakers, advocacy groups and health experts. On Monday, the investigative nonprofit ProPublica published wrenching audio from inside one of the facilities. In the recording, children can be heard wailing, sobbing and calling out for their parents. On Tuesday night, The Associated Press reported that children as young as infants were being separated and cared for in "tender care" facilities. Dr. Colleen Kraft, the president of the American Academy of Pediatrics, told CNN earlier this week that separating children from their parents "is nothing less than government-sanctioned child abuse." The president of the American College of Physicians, Dr. Ana Maria Lopez, said the separations could have persistent detrimental effects. "The effect of this type of event will follow these children into adulthood and into their entire lives," she said. "Our federal government is causing a situation that is creating a host of potential health consequences for an entire category of people." In his op-ed, Sessions defended the policy and urged Congress to take action to reach a long-term immigration solution, even though President Donald Trump has the ability to unilaterally take action. "We do not want to separate parents from their children," he wrote. "What we want is a safe, lawful system of immigration that would end this question altogether. We want to build a wall to prevent illegal entry. Congress could make that happen quickly --- and they should," Sessions said. On Tuesday, Trump met with Republicans on Capitol Hill to discuss legislative ways to end the family separations. While some lawmakers emerged from the meeting convinced that Trump had endorsed a compromise measure, others said the President appeared noncommittal. "It's always nice to see the President but this didn't move the ball," one Republican lawmaker told CNN.